This is a very simple thing that can lead to more frustration and often expensive misdiagnosed repairs. Have you been experiencing some strange electrical problems in your older Mercedes? Maybe you have taken the fuse box cover off and wiggled a few fuses and it has solved the problem for a while. You probably noticed corrosion on the tips of the old aluminum fuses. Who ever designed these old fuses did not get a good education in dissimilar metal corrosion... You don't put aluminum up next to copper - add in moisture and heat and expect to not have corrosion problems. We have a source of brass/copper alloy high quality fuses that do not corrode in the fuse holders. Over the years we changed out all the old aluminum fuses in every Mercedes in sight and replaced them with this new type. No more intermittent or weird electrical gremlins!! 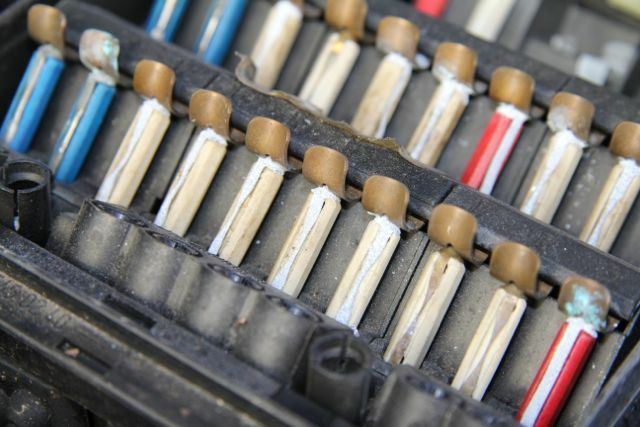 Give your fuse box a good cleaning and install these fuses for peace of mind. We have fuse kit upgrades with instructions for models from the late 50's up to the mid 90's. Take a look at this fuse box in a 126 chassis 1990 300SEL. No wonder the owner was complaining of intermittent electrical problems!